Have we become what we hate? He cited several scientific, sociocultural, economic, and political situations where the maxim appeared to be true. The physician who believed he was inventing a pill to help women become pregnant had actually invented the oral contraceptive. Germany and Japan, having lost World War II, had become peaceful consumer societies. The People’s Republic of China had become, at least back in 1971, a puritanical nation. Today, many of the values that we, as a nation, profess — protection of civil rights and human rights, assistance for the needy, support for international cooperation, and promotion of peace — have become inverted in our actions. As a nation, we say one thing, but often do the opposite. As a nation, we profess protection of civil rights. But our criminal justice system and our systems for federal, state, and local elections discriminate against people of color and other minorities. As a nation, we profess protection of human rights. But we have imprisoned “enemy combatants” without charges, stripped them of their rights as prisoners of war, and tortured many of them in violation of the Geneva Conventions. As a nation, we profess adherence to the late Senator Hubert H. Humphrey’s dictum that the true measure of a government is how it cares for the young, the old, the sick, and the needy. But we set the minimum wage at a level at which working people cannot survive. We inadequately fund human services for those who need them most. And, even after implementation of the Patient Protection and Affordable Care Act, we continue to be the only industrialized country that does not ensure health care for all its citizens. As a nation, we profess support for international cooperation. But we fail to sign treaties to ban antipersonnel landmines and prevent the proliferation of nuclear weapons. And we, as a nation, contribute much less than our fair share of foreign assistance to low-income countries. As a nation, we profess commitment to world peace. But we lead all other countries, by far, in both arms sales and military expenditures. In many ways, we, as a nation, have become what we hate. Image Credit: Dispersed, Occupy Oakland Move In Day. Photo by Glenn Halog. CC by NC 2.0 via Flickr. 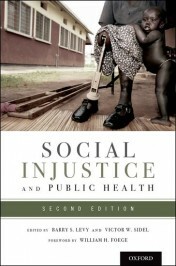 Barry S. Levy, M.D., M.P.H., and Victor W. Sidel, M.D., are co-editors of two editions of the books Social Injustice and Public Health, War and Public Health, and Terrorism and Public Health, all of which have been published by Oxford University Press. They are both past presidents of the American Public Health Association. Dr. Levy is an Adjunct Professor of Public Health at Tufts University School of Medicine. Dr. Sidel is Distinguished University Professor of Social Medicine Emeritus at Montefiore Medical Center and Albert Einstein Medical College, and an Adjunct Professor of Medical Ethics in Medicine and an Adjunct Professor of Public Health Policy and Research at Weill Cornell Medical College. You keep repeating NATION. The United States are not a Nation but a Republic. Get yer facts. Please.